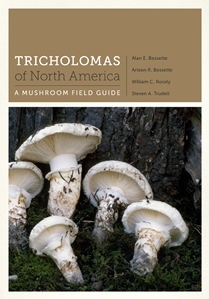 Tricholomas of North America is 208 pages in 7x10 format. The book is beautifully bound and illustrated. It begins with a 9-page introduction followed by a 16 page dichotomous key to species divided by general cap color with separate sections for species found in the east and the west. There is a one-page table of distinctive microscopic features. The descriptions of species include 71 fully described species. Typical descriptions are on one page with one to three images of the species on the facing page. There are twelve rare species that are not illustrated, six common and variable species with four illustrations, eight species with five illustrations, one species with six illustrations and one with eight illustrations. Fourteen unnamed species are illustrated and described in variable detail. The book concludes with a discussion of excluded species, glossary, references, and common and scientific name indexes. The photography is beautiful and the visual impact is stunning. Many images are ½ page, none are smaller than 1/3 page. While most of the photography is by the authors, 15 additional photographers contributed to the book. I have tested the keys against pictures in my collection and the keys appear to work well. I was even able to figure out one of my mystery Tricholoma species that I had not located in other sources. I like the fact that many species are double keyed – for example if the interpretation of cap color is likely to be variable, the mushroom keys out under multiple likely cap colors. The descriptions appear accurate with strong emphasis on physical details and just enough microscopic information to confirm a find. I really appreciated the comments section for each species with the emphasis on how similar species can be distinguished. The book is written with a minimum of technical terminology so that it is accessible to a general audience. I believe that both professionals and dedicated mushroom hunters are going to want this book in their collection. This review was published in the January-February 2013 issue of The Mycophile.